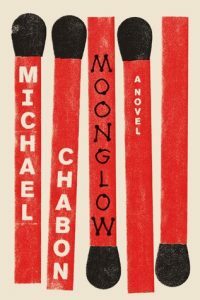 Michael Chabon returns in top form with Moonglow, a riveting and thought-provoking novel… or is it a memoir? This sweeping familial tale, told via the deathbed recollections of a character the narrator refers to only as “my grandfather,” is neither pure fact nor pure fiction. A smart, engrossing, profound tale that ranges from prewar Philadelphia to Nazi Germany to a Jewish retirement village near Cape Canaveral, this masterpiece marks a new apogee for Chabon. His most daring book to date, Moonglow is peppered with deftly-handled narrative experimentation, balanced with liberal doses of humor, and peopled with sparkling, fully-realized characters. This book’s luminous insights will resound long after you close the covers. Like the rockets at the heart of the story, with a force sometimes terrifying but never less than awe-inspiring, Moonglow soars. You can read more and buy the book here. This entry was posted in Book Reviews and tagged fiction, literature, novels. Bookmark the permalink.